Police are said to be searching for people buried in rubble on Divadelni Street. POLICE SAY A powerful explosion has damaged a building in the center of the Czech capital, Prague, and they believe some people are buried in the rubble. Police spokesman Tomas Hulan says it is not immediately clear what caused the blast in Divadelni Street, but it was likely a natural gas explosion. The street is covered with rubble and has been sealed off by police. Jirina Ernestova, spokeswoman for the rescue service says rescuers expect some people are buried under the rubble. Zdenek Schwarz, head of the rescue service in Prague, says up to 40 people have been injured. Windows in buildings located hundreds of meters from the blast were shattered, including some in the nearby National Theatre. “There was glass everywhere and people shouting and crying,” Vaclav Rokyta, a Czech student, told the AP near the scene. “I was in the bathroom, no windows, the door was closed, honestly, if I had been in my bed I would have been covered in glass,” said ZB Haislip, a student from the US state of North Carolina who was in a nearby building. The Faculty of Social Sciences of Prague’s Charles University and the Film and TV School of the Academy of Sciences of Performing Arts are located next to the damaged building. Email “Pics: Prague explosion – Up to 40 injured, some trapped under rubble”. 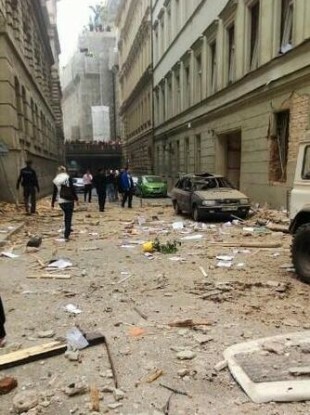 Feedback on “Pics: Prague explosion – Up to 40 injured, some trapped under rubble”.